Last Monday I was in Szeged and I have seen the flag. This flag is NOT an hanging flag. Ratio: 2:1. On blue field there is the Coat of Arms of the city. On 1 October, 1997, a part of the city, Algyo, left Szeged and became an independent village again. This flag appears at Dr. Széll Sándor: Városaink neve, címere és lobogója (1941) as "Szeged, Csongrád Co.". Szeged flag is a banner of arms (The Coat of Arms kept its place even during the Communist regime with red star added). It won't surprise me if the same flag is also in use today. 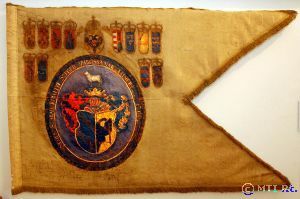 An historical flag with the Coat of Arms of Szeged. New exhibition in Szeged "The most beautiful flags of the last two centuries" by the Móra Ferenc Múzeum. Szeged city - "The today Coat of Arms of the city adopted the eagle from the old Coat of Arms. The pattern's blue field with the silver stripes relates to the Tisza and Maros rivers. The gold sun is the symbol of the uninterrupted renewal and relates to Szeged as a city of the sunshine and as the center of the intellectual life of the country region." The Coat of Arms originally was given by King Charles (Károly) III on 21 May 1719, when the city became Free Royal City (again). The Coat of Arms was removed in 1948 (cmmunist era). I came across a photo of a honoris causa ceremony that included three flags: EU, Hungary (state flag) and a light grey flag with a Coat of Arms in the center that I could not identify. The photo is at <www.pharm.u-szeged.hu>. The logic dictates that the third flag would be that of the University, though that the arrangement of the three flags is not quite as it should be according to the protocol rules. The Coat of Arms of the University of Szeged may be see on their home page <www.u-szeged.hu> but not of the best quality, however, clearly the same emblem as on the flag in question. I suppose that the text around the Coat of Arms reads in Latin: Universitas Scientiarium Szegediensis, and in Magyar: Szegedi Tudományegyetem. (The amount of text around the Coat of Arms would suggestthat both languages are used). At another photos in here and here, you'll find the same symbol hanging on the wall. According to it, the flag belongs to the "Universitas Scientiarium Szegediensis / Szegedi Tudományegyetem". About the history and the name of the university see <en.wikipedia.org>. The SZEGEDI TUDOMÁNYEGYETEM (University of Sciencesof Szeged, Szeged University, or simply University of Szeged) is located in the eponymous city. It has now incorporated several other institutions which were either autonomous or totally separate as faculties or departments of the university, notably the former Juhász Gyula University of Education. The university logo is also the university seal, and can be seen on Wikipedia. It consists of an escutcheon with a scalloped top, curved flanks, and a pointed base. The escutcheon is divided per fess, with the Chief being by far the largest portion. The Chief has a field gules charged with a Griffin Rampant or facing dexter and grasping a flaming torch or in its forepaws. The base of the escutcheon is separated by two horizontal pale blue lines fimbriated azure from the Chief. It has an azure field charged with the walls of a city in pale blue; the brickwork is detailed in black, and is surmounted by three embattled towers, of which the middle one is the highest. There is also a portcullis directly beneath this central tower, with a black moat below it. The escutcheon rests on two laurel wreaths vert with their stems crossed saltirewise and bound with a ribbon gules edged sable and folded into three parts, with their ends being forked. The ribbon is inscribed in black block lettering with the university motto, VERITAS LIBERTAS VIRTUS (Truth Liberty Virtue). The university name is written in Latin in black block lettering around the upper circumference of the entire design and in Hungarian in the same format around the lower portion, with two small black dots at the three and nine o'clock positions respectively. The photograph menthioned above clearly shows a gray or silver rectangular flag emblazoned with the university arms as described at length above.